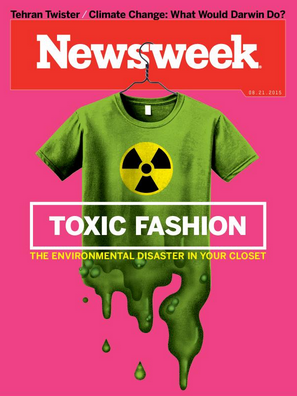 Cheap Made in India T-shirts sold in US, Europe "contributing" to water pollution crisis in India, warns "Newsweek"
In a scathing critique, top US journal “Newsweek” has warned American and European consumers that if they were wearing T-shirts with the 'Made in India' tag – bought from Gap, Tommy Hilfiger, Wal-Mart or other malls – they should know they might have “contributed” heavily in a “water pollution crisis that has destroyed almost 30,000 family-owned farms” in India. Competing with their counterparts in Cambodia, Laos, Indonesia, China and Bangladesh to sell T-shirts that cost as low as $5, Indian T-shirts are made mainly from the Netaji Apparel Park, situated in Tamil Nadu’s Tirupur, known as India’s ‘Knit City’, whose “rivers are often red or purple with runoff from nearby factories”, it said. While a nearby dam was “supposed to update agricultural irrigation practices in Tirupur”, the situation by mid-2000s reached such a point that “the water was so saturated with chemicals, salts and heavy metals that local farmers were petitioning the Madras High Court—the highest court in Tamil Nadu—to not release the water into their fields”, the article says. “A 2007 study by a local nongovernmental organization found that Tirupur’s 729 dyeing units were flushing 23 million gallons per day of mostly untreated wastewater into the Noyyal River, the majority of which collected in the Orathupalayam Dam reservoir. When officials finally flushed the dam in the mid-2000s, 400 tons of dead fish were found at the bottom”, the article adds.